In more severe disease, there is evidence of inflammatory cell aggregation, with macrophages, lymphocytes and monocytes within the airway walls and neutrophils predominating in the airway lumen. More severe disease is associated with progressive destruction and loss of elastin, smooth muscle, mucous glands and cartilage. Lymphoid follicles attain such size that in places they lead to regional obstruction of small airways with distal collapse. The essential lesions are destructive mural bronchitis, bronchiolitis and interstitial inflammation.15Airflow obstruction affecting both large and small airways is a key feature of bronchiectasis and results from loss of structural integrity as well as inflammatory infiltrate within the airway wall. This airflow obstruction inhibits the clearance of sputum, bacteria and inflammatory mediators expressed in response to airway microbiota. The gross pathology of the various forms of bronchiectasis are illustrated in Figures 1a to c, and the diagnostic features in Figures 2a to f.
Host defence in the lung is maintained by both innate and adaptive immune mechanisms and a major contributor is the maintenance of an effective mucociliary barrier. This barrier is comprised of airway mucus that traps inhaled foreign matter, including microbiota, and a ciliary escalator that drives mucus and entrapped material upwards for subsequent clearance by expectoration. These protective mechanisms are broken down in conditions such as chronic bronchitis, emphysema and bronchiectasis, which variably cause pathological distortion and destruction of the normal airway anatomy, mucus hypersecretion and subsequent disruption of mucociliary clearance from the lung. In the acute setting, bacteria in the airway or distal alveoli may cause lower respiratory tract infections. In the structurally normal lung, resolution of infection is associated with clearance of the airway of all the involved bacteria, inflammatory cells and mediators. In the structurally damaged lung, however, these clearance mechanisms fail, and airway colonisation, infection and inflammation persist. 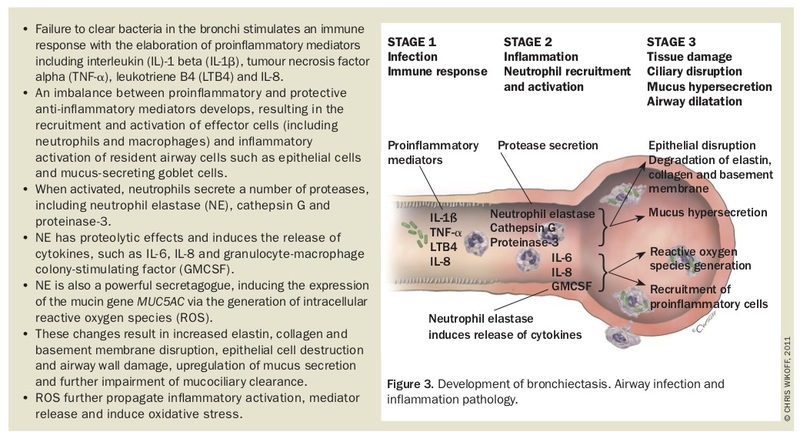 Dysfunction of the respiratory epithelium (ciliary dyskinesia) and depletion or dysfunction of immune mediator cells and molecules, including immunoglobulin (Ig) G and IgE, complement (due to mannose- binding lectin deficiency), cathelicidins (antimicrobial peptides), toll-like receptors (which are key to pathogen recognition), neutrophils, macrophages, and T and B lymphocytes, may permit microbial persistence, excessive inflammatory response to infection and failure of mucociliary clearance. It is not surprising, therefore, that bronchiectasis may result from several pathological insults that are disparate but unified by their impact on depletion of immune function, promotion of airway inflammation and impairment of mucociliary clearance. 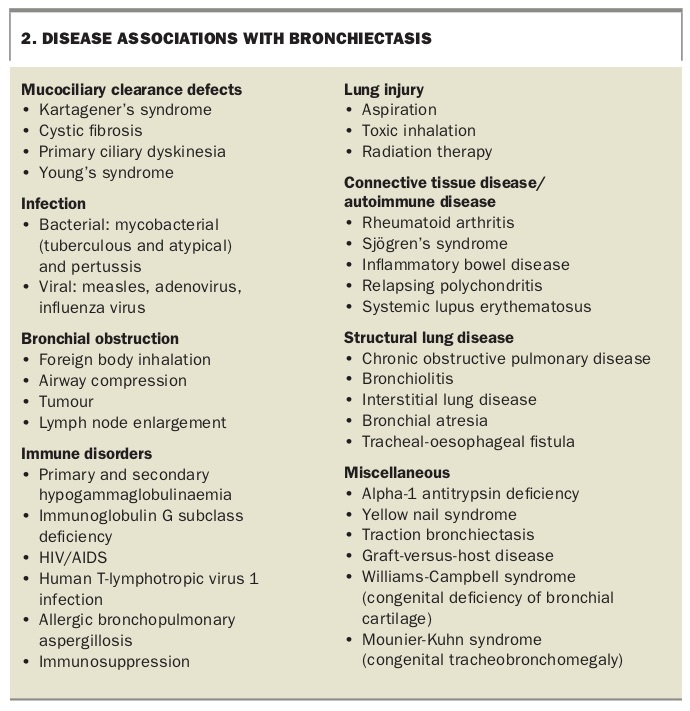 The diseases frequently associated with bronchiectasis are listed in Box 2. 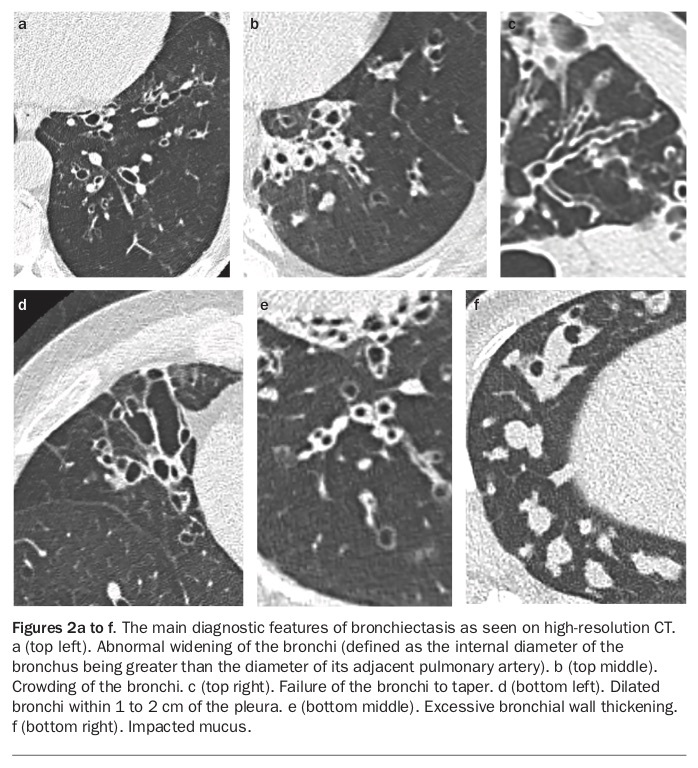 The process of development of bronchiectasis is expanded in Figure 3. If this cycle of infection and inflammation is uninterrupted then progressive lung injury occurs, leading to worsened lung function and ongoing inflammation promoting both symptoms and pulmonary exacerbation. The key to breaking this cycle therefore resides in clearance of proinflammatory bacteria and the downstream inflammatory mediators from the airways to reduce the overall inflammatory burden and consequent lung damage. The diagnosis of bronchiectasis should be considered in children and adults with cough and chest symptoms suggestive of chest infection, particularly when there is a history of purulent sputum production, a family history of bronchiectasis or a history of pneumonia in infancy or childhood. 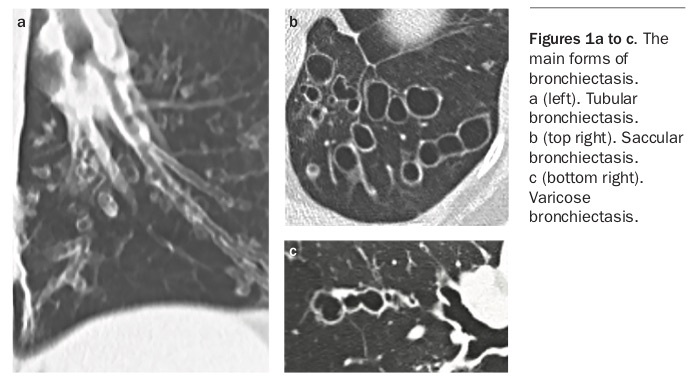 There are no pathognomonic features in bronchiectasis so a high index of suspicion is required.